At Trillium Dental in Ottawa, we are pleased to offer Invisalign® teeth straightening treatments for dental patients who prefer a more discreet method than braces. These “clear braces” come with a number of benefits, as they are much less noticeable than metal brackets and generally cause patients less discomfort. Invisalign is the clear choice for many adolescents and adults alike, but many have questions about this advanced dental technology. 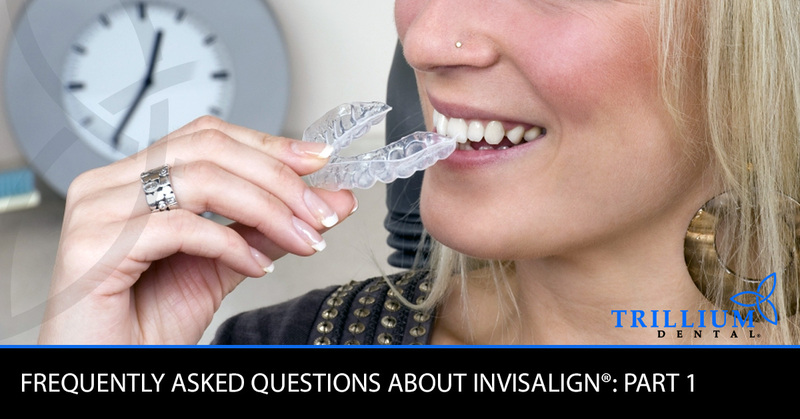 From our family dentists and dental hygienists, here are answers to some of the most commonly asked questions about Invisalign. Some patients who visit our Ottawa dental clinic for cosmetic dentistry treatments aren’t quite sure what Invisalign is, much less how it works or why so many people prefer it over traditional braces. Put simply, Invisalign is a teeth straightening method in which a set of clear retainers (also referred to as “clear braces”) are molded to a patient’s teeth with each set being slightly more straight than the one before. These teeth straightening retainers are clear and removable, making them a subtle and comfortable alternative to metal brackets with wires, rubber bands, spacers, etc. Plus, Invisalign is equally as effective as braces! Another commonly asked question about Invisalign is how the treatment works, given that there are no metal brackets glued to the teeth with metal wires holding them in position. The answer is actually quite simple — Invisalign retainers work by holding your teeth in place with a clear plastic retainer that has been molded to the teeth, which gets switched out with the next retainer after just one to two weeks. These micro-adjustments continue until the patient is on the last retainer in the set, which is the ideal position of their teeth. When the patient has reached this stage of their Invisalign treatment, one of our dentists will assess their progress to ensure that no further corrections need to be made. Then, the patient will be provided with a retainer to wear at night from then on out in order to ensure that their teeth do not move out of the proper alignment over time. Like braces, the treatment duration of Invisalign is contingent on a number of factors, particularly how diligently you wear your teeth straightening retainers. The Invisalign treatment typically takes between 12 and 15 months to complete, assuming that the patient has worn their retainers at all times (ideally 22 hours per day), except to eat, floss, and brush their teeth. Oftentimes, Invisalign treatments take less time to complete than braces (which can take more than two years), but it can be tempting for patients to remove their retainers more often than recommended, which can prolong the process. However, if you’re consistent with wearing your Invisalign retainers as often as you should, in addition to maintaining good oral hygiene habits, you’ll have perfectly straight teeth in no time! As previously mentioned, there are many benefits of Invisalign teeth straightening treatments in terms of both aesthetics and patient comfort. Many dental patients opt for Invisalign because the retainers are clear and thus more difficult for others to notice at work and in other social settings, which gives them more confidence when talking with others. Not only are these “invisible braces” less noticeable than braces, but they are also less apparent to the patient, as they acclimate to them quickly and don’t have to endure the constant irritation of tightened wires, cheek scarring, and other painful complications of braces. With this is the benefit of being able to eat whatever you want, as you can remove Invisalign retainers before you eat, then brush and floss your teeth before putting them back in. Anyone who has had braces knows how frustrating it is to not be able to enjoy your favorite foods because of your braces, and with Invisalign, that’s not an issue. So, don’t be afraid to bite into an apple or chew on your favorite candy when your Invisalign retainers are out, as long as you make sure to keep up on your oral health routine so you don’t encounter dental problems like cavities, gingivitis, or cracked teeth. Got more questions about Invisalign? Want to know what Invisalign costs and which types of dental insurance apply to this treatment? Continue to part two of this blog series, or contact our family dentists to learn more about the Invisalign treatment process. Our dentists would be more than happy to answer any questions you may have, and we welcome new patients to our Ottawa dental office to take advantage of our teeth straightening options and family dental care. And, if you’re ready to get started, schedule your Invisalign consultation today at Trillium Dental to see whether clear braces are right for you!